When you bring your new bundle of joy home from the hospital, you want him or her to feel safe, protected and nurtured. 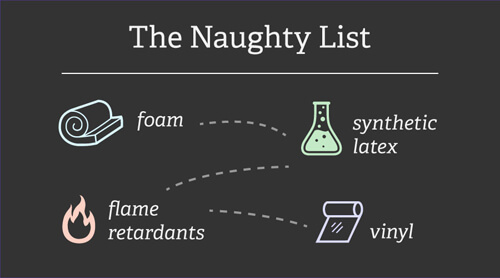 But, most people don’t realize that they’re likely exposing their little ones to hundreds of chemicals in a brand new nursery including VOC’s (volatile organic compounds), petroleum derived products, flame retardant chemicals, solvents, plasticizers and more! The VOC’s alone can irritate the eye, nose, and throat, cause headaches, loss of coordination, and nausea, and damage the liver, kidney, and central nervous system. Um, not exactly what we’d call a safe haven. In fact, ABC News reported the air quality inside a newly furnished + painted baby nursery can contain over 300 different toxic chemical compounds! Children, especially, are vulnerable to toxins with their developing bodies. They breathe more air, pound for pound, than adults. Children spend over half of their young lives on their new crib mattress during a critical development phase. It’s well documented that standard mattresses can contain toxic chemicals. Introducing SleepLily, started by a mom who wanted to make sure her kids had a safe, nontoxic mattress to dream on each night. Chemicals often used by mattress companies are linked to cancer, affect liver function, harm the nervous system, delay puberty, cause reproductive problems, and a host of other life-long conditions. Concerned parents of Emerie & Hadley were frustrated with some of the greenwashing they encountered by misleading marketing terms and false advertising when it comes to finding a truly health mattress. Words like ‘organic,’ ‘natural’ and ‘plant based’ are basically meaningless without certifications to back those claims. For example, there is no regulation around what percentage of plant-based materials must be used to call the foam “plant-based.” So manufacturers often use as little as 3% plant-based materials, and the remaining 97% is still petroleum-based. The founders of SleepLily made a commitment to their family to solve these issues by creating a mattress – for adults and children – that would only use the best, most natural materials. And, SleepLily would process all these materials gently and naturally. They NEVER use any harmful chemicals. This means no polyurethane, no polyethylene, no synthetic latex, no vinyl, no antimony, no halogenated flame retardants (HFRs), no perfluorinated compounds (PFCs), no water-proofers, no harmful chemicals period! Everything they make is GOTS-certified – the most reputable 3rd-party certification of purity. Everything they make be available online & affordable, so all parents can benefit from the mattresses. You spend one third of your life in your bed. It just makes sense to invest in a healthy, quality and toxic-free mattress. Whether you prefer natural latex or innerspring, SleepLily has you covered with every price point to fit your budget! 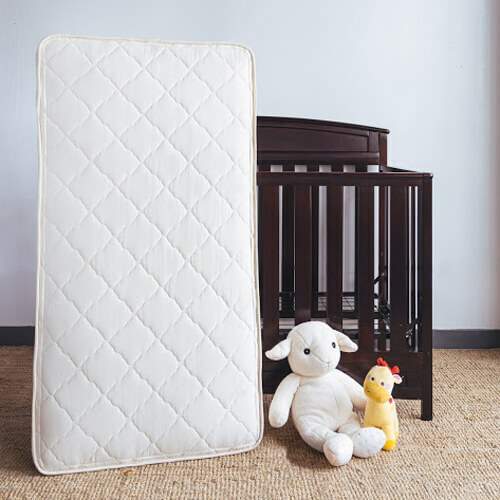 Shop their complete line of nontoxic mattresses for baby (crib and cradle), kids and adults! Safety – Everything they make & sell must first be 100% pure and safe. This means no toxic chemicals, no harmful ingredients, no compromises. Comfort – Not only do they make the purest mattress, they also make the most comfortable. It’s backed up with a 90-Day Sleep Trial Guarantee. Honesty – SleepLily provides open & honest information on all of their products and do this in a way that is simple to find and easy to understand. They provide a fair price that passes onto you the savings they get by not having the expense of running a physical store. Hand Crafted in the USA – Each mattress is hand-crafted in California and uses only the safest, most natural ingredients – like organic cotton, PureGrow wool, and natural latex. Ready to Win a SleepLily Mattress or Gift Card? One [insanely] GRAND Prize lucky RonandLisa.com reader will win a SleepLily Best-selling Non-Toxic Crib Mattress valued at $330.00! **PLUS, FIVE FIRST PRIZE winners will also receive a $75.00 gift certificate applicable towards a purchase at SleepLily! Who’s ready to lay down to sleep, breathe cleaner air and protect their loved ones? Will you be one of the *lucky* winners? Enter daily for a chance to WIN and please share this page with a friend, loved one – or anyone – that could benefit from sleeping on a safe and nontoxic mattress every night! Zzzzzz. For every action below that you complete, you receive a specific number of entries. Click each individual action to enter yourself. For actions you have done in the past (i.e. you are already a fan of SleepLily Bed on Facebook) just click directly on ‘I did this’. The eligibility of the winner will be verified by The Healthy Home Dream Team®. There is no mandatory entry. Each action will earn different numbers of entries into the contest. You may Tweet or share on Facebook or Google+ for an entry once per day. All other actions will only be counted once. Sweepstakes open to US residents age 18 and over. Contest ends 11/26/16 at 12:15am PST. How? For starters, we offer three firmness levels of our tempered steel, Bonnell innersprings, so you can pick the firmness that’s just right for you. I like the Pure Bliss Non-Toxic Mattress them most of all of the available choices on the web site.